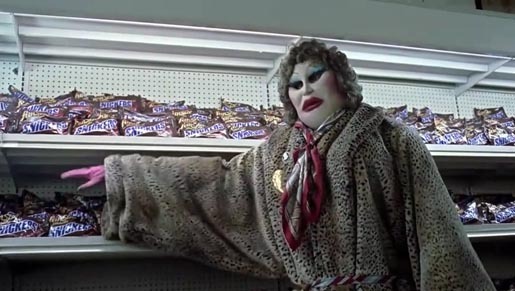 Snickers are being promoted as the candy of choice in “Halloween Grocery Store Lady”, a commercial directed by Smuggler director Guy Shelmerdine. Mrs Jensen is approached in the supermarket by a very tall masked older woman wearing an over-sized coat. She’s told she doesn’t have enough Snickers candy bars in her shopping cart. The neighborhood kids love Snickers on Halloween. The Grocery Store Lady proceeds to caress the woman’s face before tipping dozens of chocolate bars into her shopping trolley. The Snickers Halloween ad was developed at BBDO New York by chief creative officer David Lubars, senior creative directors Peter Kain, Gianfranco Arena, associate creative director/copywriter Alex Taylor, associate creative director/art director Jason Stefanik, agency producer Hyatt Choate, account manager Courtney Lord. Filming was shot by director Guy Shelmerdine via Smuggler with director of photography Mott Hupfel. Editor was Tom Muldoon at Nomad Edit.